Now that I have started working for a legitimate company, its funny to find out about the certain benefits and perks of a job. One of the main perks for a legitimate job in New York City during the summer is the policy known as "summer fridays," where you work a half day for every Friday from the Friday after Memorial Day until the Friday before Labor Day. There is something strange and antiquated about this policy as some kind of New York tradition that I find very appealing - well that and the fact that you don't have to work a full day. With the short day, I decided to head down to Rockaway Beach and spend the weekend with some friends at the beach, which included the typical beer drinking, swimming, sunburn, fish-grilling and "two dog day" policies that are a part of any type of beach weekend. This beach weekend only enhanced the fact that Sunday featured two great sports stories and one slightly less intriguing. We'll run through them right now and then hit some general points that I want to touch on. - I love the French Open Final because it is yet another signal of the summer coming and there is something rewarding about waking up earlyish on a Sunday, maybe slightly hungover and getting a bagel or egg breakfast and watching a tennis final. I have become a slow tennis fan over the past two or three years and I am nearly fascinated with it. So fascinated that I may pull a David Foster Wallace and even wax poetic about the dynamics of the game on this blog in the very near future. I have a clear memory in my mind of a weekend in the summer of 2006 when I went with one of my best friends to Astoria to visit his older brother and his girlfriend. My friend and I were underage, but we snuck into bars in Manhattan with a crew of older people and then broke off and adventured on our own on the Lower East Side to visit some friends of ours, ending up back in Astoria at about 5:00 AM to sneak into the apartment of my friend's brother's girlfriend where there were about ten people crashing on the floors and couches. I find myself a nice piece of lineoleum in the kitchen and spread out to sleep. That sleep did not last long since it was so uncomfortable and the next morning we went to a Greek Diner for breakfast, where much to my surprise I watched Rafael Nadal defeat Roger Federer in the first truly enjoyable tennis match I ever watched. Now, this past Sunday, after a year of hardship and injury in 2009, Nadal once again won the French Open. There is something moving about watching an amazing athlete like Nadal bawling into a towel after he wins a championship. Watching that image was one of the few times I got goosebumps watching an athlete's emotion on television - this was because I could follow the psychology of Nadal's tears. He was so beaten down by his misfortune last year that rising back to the top meant so much to him, the memories of his hard work flashing through his mind, that he had nothing to do but cry. Now, that is tennis. Nadal is now the number 1 player in the world as we approach Wimbledon, which is Federer's favorite tournament. Obviously, there is a showdown looming in England in two weeks and I can only hope that on Sunday, July 4 of all days, we get to see Federer vs. Nadal III at Wimbledon. If I get to watch that match in the morning on July 4, then you are all in for a blog post of epic rambling proportions on the subject of tennis. There will be no factual information about the game itself, but only hypothetical and poetic ruminations on two men facing each other in one of the most fascinating games in the history of human civilization. If you had asked me in 2005 if I would have ever written that statement, I would have laughed and laughed all the way to the fridge. - Yesterday evening, we were treated to one of the better NBA Finals games in recent history. 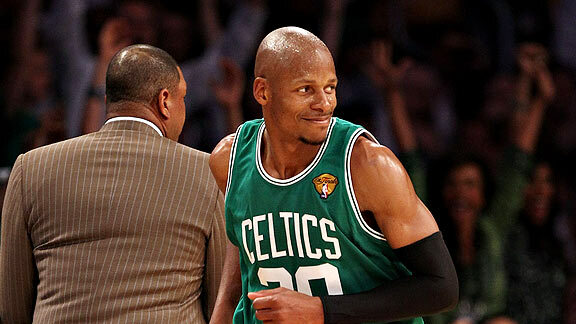 In Game 2, Ray Allen went insane. Going 7 for 7 on three pointers in the first half and setting the record for three pointers in an NBA Finals game at 8. However, the Celtics almost let the game get away from them until Rondo took over in the fourth quarter. It is somewhat amazing that in a game where Ray Allen scored 32 points and hit 8 three pointers and at one point you wondered if he would ever miss a shot again or even hit the rim on a shot again, that Rajon Rondo was arguably the player of the game. He finished with 19 points, 12 rebounds and 10 assists, which is a pretty ridiculous line. Yet, his true greatness came with his defense. First, the ridiculous strip of Derek Fischer's three point shot where Rondo over commited to defend the shot, going past Fischer, but then managed to halt his momentum, plant his foot, dart back and use his freak arms to strip the ball from behind Fischer's head as he was releasing the shot. Second, his gamble on the around the back poke away from Kobe, which basically ended up sealing the game for the Celtics. It was a hard fought game on both sides with some questionable foul calls going against both teams. For the Celtics to win, they need to make Kobe take a lot of shots and try to put the Lakers on their back. Ray Allen has to be the MVP of the series and Rondo has the play solid and dictate the tempo, scoring in the 15-19 point range. Garnett and Pierce have to focus on defense, and offensively, Garnett simply has to worry about facilitating and not scoring, while Pierce needs only one monster game. If that all happens, the Celtics win the series. For the Lakers, its simple. Limit Artest's mistakes, get one big game from Odom and continue to give Bynum and Gasol the ball. Those are the game plans. The adjustments for each team from game to game will be minimal - this series now is all about who will just play their game harder from game to game. Tomorrow night's game is huge because of the long travel and short rest. Who is going to be able to play in their highest gear? - The somewhat lukewarm event was Game 5 of the Blackhawks vs. Flyers Stanley Cup Final. Last night's game was the least exciting of the five games so far. However, each team has won out at home so far in the series and I believe the Flyers will keep that trend alive in Game 6. This Flyers team has a chance to be perhaps one of the best teams we have ever seen when they play with their backs up against the wall. They came back against the Devils, they came back from 3-0 against the Bruins and they looked bad after two games against the Blackhawks only to even the series. I think we are going seven games in that series, which is only good for the NHL because hopefully then NBC will have to air that game in prime time during the week instead of relegating it to Canadian television. - I just finished Paul Harding's novel Tinkers. This is a phenomenal novel that anyone should read. The writing is very clear and concise, with plenty of strong and vivid imagery. However, what makes the book so rewarding is the manner in which Harding plays with the techniques of inner monologue and stream of consciousness in relaying the memories of George Washington Crosby and his father Howard. I won't spoil the rest of the plot - what there is of it - but will simply say that is an excellent novel that ruminates very much on death and the way we weave and construct our own families and lives. You can read the prose easily but still feel challenged by the way the story itself is told. There is something very Faulknerian about it. Tinkers is my kind of book and Harding is my kind of writer. - Sticking to my kind of novel, I have just started reading the novel Stoner by John Williams, which was recommended to me by a co-worker/friend. The novel already has a very familiar tone and style to it that I can't place since I have only cracked into. However, there is something very Wolfeian about the collegiate setting of the outset of the book and also about the way that Williams relays feelings of discovery in his protagonist. I am waiting to see how it develops, but much of the writing strikes me as something that I would pull forth out of my pen. Not to say that Williams is in the same league as I am, but that I need to let these observations develop. - Speaking of being in the same league as other writers, the New Yorker has just unveiled their Top 20 Writers Under 40 List. The New Yorker last unveiled a list like this back in 1999, which included authors such as Michael Chabon, Jonathan Franzen, and Junot Diaz. This list has some usual suspects like Jonathan Safran Foer and Nicole Krauss, a welcome member in Gary Shytengart (Absurdistan is very good), and overrated guest in Joshua Ferris (And Then We Came to the End was not fantastic), and a guy who can give a great interview, though I have never read his work in Phillipp Meyer. I have not read a majority of these writers on the list, though I have read about their work. I'm going to delve into some of their books as part of my summer reading in order to better study up on the competition. In their New Yorker interviews, take a look at how many of them say they question being a writer everyday - classic artistic self-loathing. I don't know if I buy into that party-line, but perhaps that's because I am not a published author yet. But seriously, anyone artistic or with some kind of desire to create art for more than one person to view, read Philipp Meyer's interview. It is very inspiring and truthful stuff to keep in your back pocket as you navigate through the world each day, encountering possibility, impossibility, abandoned dreams and false ambitions. Definitely good stuff, until my interview gets posted up there on the 2020 list. That's it for today. We have Game 3 of the NBA Finals tomorrow night so I will be putting up another excerpt of From Here to the Last Mound of Dirt so I can focus on the game. Later in the week I hope to have the Puddles of My Own Podcast recorded and posted in order to end this podcast drought. I'll get in all in order. However, in the meantime, you can always check out the Puddles of My Podcast archives or just check out LillebyTube for some video podcasts. Enjoy the coolness of the night my Puddlers.